Well, one year I'll be organised, and have a nice, calm lead up to it all.. Unfortunately this year ain't one of them! 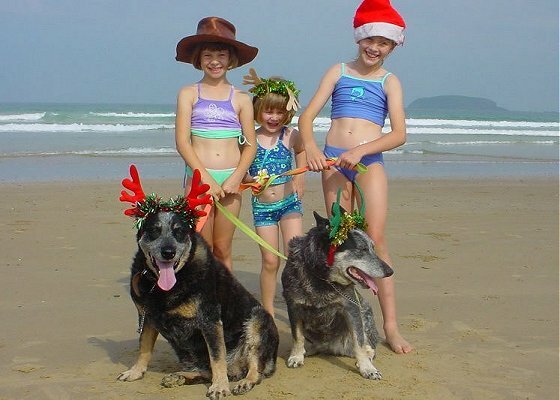 We leave on the weekend for a week in Blackheath (to spend Xmas Day with Marc's parents, plus my family are coming up there Boxing Day)... and then another week hopefully meeting real estate agents in Burrawang, with a view to selling our house there by mid 2003. But 2002 for the Schmidts? Much of the same, really. Marc working away overseas a fair bit. Ended up in China for 7 or 8 weeks straight in the first half of the year. Since September he's been to Indonesia, Philippines, and back to China again. It's almost a novelty having him home. Needless to say not much has happened around the house or yard this year, though we did manage to shout ourselves some much needed bedroom furniture. Alison is reading way beyond her year, and would excel even more if she wasn't a tad vague and prone to just coasting along having a fine time. (Still, early days!) Strong little runner, and gets comments about her lovely swimming style (she does an hour squad each week). Loved the acrobatics this year with the dancing teacher, and cartwheeling around the house eased off. But by the end of the year she was practising her headstands instead, and can hold one for at least 30 seconds! Nippers is doing wonders for her self confidence (usually winning her flag race and wade within the club). She just doesn't like the limelight like her big sister! Zoe has come ahead in leaps and bounds with her swimming lessons, and looks like following biggest sister's footsteps into dancing next year. Still Miss Cautious. (Will probably still be on trainer wheels at 10!). Doesn't like surprises, or people she doesn't know (that includes Santa for that matter!.) Finally decided the beach was ok, and actually had a ride on a boogie board not so long ago. Learnt to skip recently, and still attracts comments when we are out for her big blue eyes. Has imaginary fairy friends who are buckled in to the seat next to her in the car, and who tend to inconveniently sit where other family members are about to plant their bottoms. One more year at home with Mum, apart from her 2 days at preschool/childcare, which she adores. She's not doing too bad in the brains department either! Can you tell things revolve around the children? Well, this year, I did manage to do a few things for myself. Chasing my internet Bulletin Board 'addiction', I got to Brisbane in June to meet up with people from there (sans kids! sans husband (he was OS) and by plane!!) and dragged Marc off to Melbourne for a long weekend (and had lunch with some folk there too). I did a short website construction course, hence the ability to make this page!! Been having fun with it all, but still desperate to find more courses and learn more, possibly with a view to working from home a bit in the field. Marc's parents have the holiday house around the corner from us and have helped with a bit of babysitting while they have been here. (Other times I manage holiday letting of it for them). Started an adult swimming squad class this last term too, and the bit of swimming is helping me try to get back on track with shedding a few kilos. Both Marc and I have found ourselves in 6-a-side soccer teams... He was complaining about lack of exercise, so I found a team for him. (He still reckons he prefers Touch, but he was pretty happy with himself after scoring a goal last week!). I still haven't figured out why I said yes to the person who talked me into a team, but I have found myself a 'niche' as the goalie! (ie. don't have to run much, but our team is so hopeless, I get a workout!) Don't know that I'll do it again though. Dragging the kids out to it on a Thursday night is a pain, although they enjoy running around like idiots with all the other kids. We actually managed to take our kayak for a paddle a couple of weeks ago (when I planned a few extra-curricular activities to keep him away from the office after he got back from China!). Would love to do more - one of those New Year's Resolutions I think. He has told work he won't go back to the Indonesian project while there are still official travel warnings (nor the Philippines I hope), and he also said 'no thank you' to working on a project in Iran. Will there be an end to the travelling? Can't see it happening in this job, and changing in such a narrow field means huge upheavals (and no guarantees that a different job wouldn't involve the same.) Will have to see what 2003 brings. Meanwhile, if you haven't already seen my experimentation in webpage construction, here are a couple of links... one to a general site (which evolved from needing to advertise the holiday flat), and another private one for family photos... We've had a digital camera this year, so have been having fun with that. Meantime, have a happy christmas, hope Santa is good to you all, and all the best for 2003. Don't forget to plan a visit our direction sometime! Nice place, next to the beach, nice temperature most of the year, and we'd love to see you!! and of course, Rags and Rattles!